The George Mason University Patriots Men’s Soccer College ID Camp is open to all male soccer players 13 to 20 years of age. It is set to run from 9 o’clock in the morning until 4 o’clock in the afternoon on the 15th of December. The program is going to take place at George Mason University’s top-notch Fieldhouse. Furthermore, this soccer identification camp will provide the participants a first-hand experience of how is to train and play like a college soccer athlete. It is going to be a physically demanding but fun experience. In addition, this event will include a college recruiting discussion. George Mason University is a public, coeducational, research university in Fairfax, Virginia. It has other campuses in Arlington, Front Royal, and Prince William. In addition, it also has a campus in Songdo, South Korea. The university is a member of the Association of Public and Land-grant Universities (APLU). It is also part of the Oak Ridge Associated Universities (ORAU), as well as, the Southeastern Universities Research Association (SURA). The university has an accreditation from the Commission on Colleges of the Southern Association of Colleges and Schools. It is one of the nation’s leading academic institutions. As a matter of fact, it is 140th in the National Universities, 2018 edition of the US News and World Reports Best Colleges rankings. It is also 89th in the Best Colleges for Veterans rankings and 103rd in the Best Value Schools rankings. Currently, the university’s total student population is around 34,900. This includes around 23,800 undergraduate students and 11,100 postgraduate students. 49 percent of this undergraduate student population are male students and 51 percent are female students. This undergraduate student population is also through a selective enrollment acceptance rate of 81 percent. Correspondingly, George Mason University’s student to faculty ratio is 16:1. In athletics, George Mason University fields 22 intercollegiate sports teams in the Atlantic 10 Conference of the National Collegiate Athletic Association (NCAA) Division I. They are the Patriots and green and gold are their identity colors. 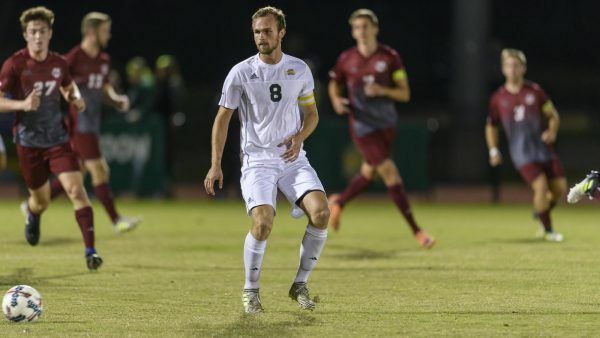 Head Coach Greg Andrulis, a native of Litchfield, Connecticut is leading the George Mason University Patriots men’s soccer team. He is a bachelor’s degree in psychology graduate from Eastern Connecticut State University. Coach Greg Andrulis also has earned a master’s in counseling at Springfield College. He is now in his 14th year at the helm of the George Mason University Patriots men’s soccer program. Ultimately, Coach Andrulis is the 2004 Major League Soccer (MLS) Coach of the Year awardee. He is also an inductee into the Litchfield High School Hall of Fame and the Eastern Connecticut Hall of Fame. Under his leadership, the Patriots have won their fifth Colonial Athletic Association championship in 2008. Coach Greg Andrulis is now holding an overall coaching win-loss record of 231-138-58. Then, the George Mason Patriots men’s soccer assistant coaches are Billy Chiles and Eduardo de Souza. Coach Billy Chiles is now in his third season with the coaching staff. He is a bachelor’s degree in sports management graduate from Towson University. Meanwhile, he completed his master’s degree in sports administration from Canisius College. Coach Eduardo de Souza is the newest addition to the coaching staff. He is an alumnus of Trevecca Nazarene University. Coach Eduardo de Souza completed his master’s degree at Mercer University. Join the George Mason University Patriots Men's Soccer College ID Camp. It is especially for boys who are aspiring to become a college soccer student-athlete. It is going to take place at the beautiful George Mason University campus which is located in Fairfax, Virginia. Overall, it will be a challenging, motivational, and fun experience.